(June 5, 2018) — Golf Inc. magazine named The Forest Preserve District of DuPage County’s The Preserve at Oak Meadows the No. 1 “Renovation of the Year” for public golf courses in the world in its May/June 2018 issue. It’s the fifth award The Preserve has won for its innovative design and environmental features since it reopened in late summer 2017. Forest Preserve District of DuPage County President Joe Cantore said the latest recognition is further affirmation that the District achieved its goals for the preserve. The Preserve underwent a major two-year environmental restoration to improve stormwater management and water quality for Salt Creek, enhance habitat for fish and other aquatic species and create a premier 18-hole public golf destination. It reopened for a brief preview season in late summer 2017 and is enjoying its full grand-opening season in 2018. Golfer feedback on the new layout, designed by renowned golf course architect Greg Martin, has been extremely positive, and elite golfers will test the new track on July 9 when The Preserve serves as a qualifying site for the U.S. Amateur Championship. 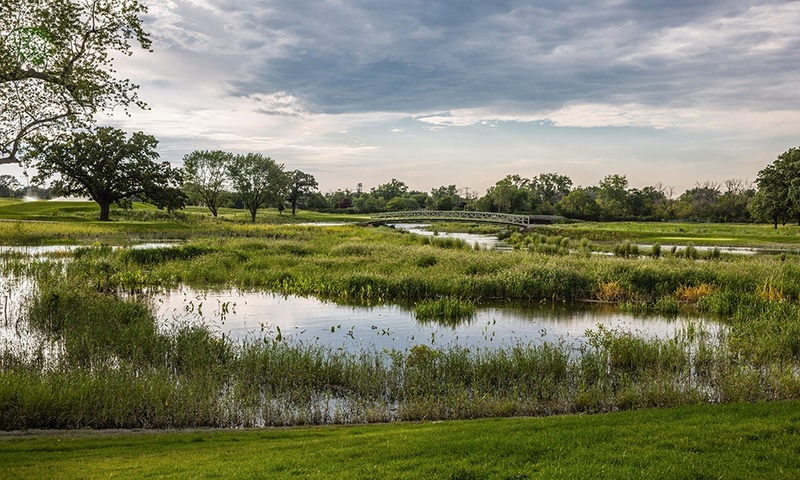 The property was reconfigured to reduce flooding in nearby communities by holding an additional 20 million gallons of stormwater from Salt Creek during flood events while also minimizing flood damage to the course. Only 15 percent of the 288 acres is dedicated to fairways, greens and teeing areas, and the number of holes was reduced from 27 to 18. In addition, 25 acres of new wetlands and 43 acres of riparian habitat were created and 1.25 miles along the Salt Creek corridor were restored to improve water quality and plant and animal diversity. Other improvements include more than 100 acres of restored upland habitat and a connection to the regional Salt Creek Greenway Trail, making The Preserve accessible to hikers, joggers and cyclists. The Forest Preserve District of DuPage County and partners the DuPage Salt Creek Workgroup and DuPage County Stormwater Management funded the restoration project. The River Prairie Group of the Sierra Club also supported the project’s initiatives. The DuPage River Salt Creek Workgroup said the “habitat has improved significantly,” noting it recorded five new species of macroinvertebrates at The Preserve in 2017 that were not found in the previous four years of studies. Overall aquatic habitat scores have increased as well. The rainiest May in recorded history tested The Preserve’s reengineered stormwater management. The former golf course would have been closed at least 16 of the 31 days in May due to flooding. However, the improved golf course remained open the entire month and helped protect the community from flooding.